Something missing in your diet? Read your own blood tests-Yes! How to reduce your risk of cancer to almost zero! Gatorade is not a health drink! Forget fillings- regrow your own teeth instead! Can you believe teeth can be regrown? Well I'm giving it a try..
Tooth-care expert Nadine Artemis shares important facts about tooth care that you will NOT hear from any conventional dentist or doctor. This vital information will enable you to take the "guess work" out of caring for your mouth and KEEP YOUR TEETH for ALL the years of your life. If you havent already picked this up, foodmatters is a great site full of info and really worth subscribing to!! Should I consume fruit sugars if Im healing from cancer? This is a debatable question among the alternative medicine community, one which I feel needs clearing up. This is a brillant answer from Dr Jameth Sheridan! A great artcle by Don Tolman on how the best foods are wholefoods! The medical establishment has created a set of terms, which they use constantly to boost their egos and firm up their authority as the unique holders of medical wisdom -- the mantra is “evidence-based medicine€, as if everything outside their anointing touch is bogus and suspect. A careful examination of many of the accepted treatments reveals that most have little or no scientific “evidence-based€ data to support it. One often repeated study found that almost 80 percent of medical practice had no scientific backing. Yet, let me, or anyone else, suggest that excessive vaccination can increase the risk of not only autism, but also schizophrenia and neurodegenerative diseases, and they will scream like banshees – Where is the evidence? Where is the evidence? When we produce study after study, they always proclaim them to be insufficient evidence or unacceptable studies. From the award-winning director of The Drugging of our Children, Gulf War Syndrome: Killing Our Own and AIDS Inc. - comes the latest film of critical social importance: Vaccine Nation. For most people, vaccinating themselves and their children seems like a good idea. Vaccines are safe, effective and are supposed to protect us against dangerous infectious diseases - Right? See for yourself why this statement may not be true... What you don’t know can harm you or kill you! We are what we digest ! Given the right nutrients, the human body inherently knows how to establish and restore excellent health, heal disease and strengthen from the inside. Yet a basic misconception is the notion that modern food contains all the vitamins we need. Many years ago, when the minerals and nutritive content of soil properly nourished plants and most foods were locally grown, fresh and eaten soon after harvesting, people consumed nutritionally richer foods. With 20th century modernization came the wide spread use of chemical fertilizers, pesticides, herbicides, additives, preservatives and other contaminants. Most of us today suffer from dietary deficiencies which cannot be remedied until the mineral – depleted soils are brought into proper balance. Foods like fruits, vegetables and grains growing on millions of acres of land no longer contain enough specific kind of minerals result in widespread nutritional deficiency, no matter how much of them we eat. A shortage of nutrients in both the growing and processing of food contains to spike, barely supplying minimum daily requirements. Even those diligently eating a diet of fruits and vegetables, food alone cannot sufficiently provide the vitamins and minerals needed to maintain a healthy and balanced life. Our culture is studded with myths, misinformation and misconceptions about the role of nutrition and supplementation on our lives. The essential ingredient for food health is education. A compromised digestive system absorbs fewer nutrients and creates the conditions for obesity and other imbalances. Quality foods enhance health, strengthen immunity and create the best conditions for overall well being. Hippocrates Health Institute supports complementary and integrative medicine with a firm conviction in a healthy plant- based diet and lifestyle. Combined with natural and high quality supplementation, robust health can be regained and maintained. Hippocrates, the fifth century B.C. Greek physician, said it best: Let food be thy medicine and medicine be thy food. Codex (Formally Codex Alimentarious - which is Latin for “Food Code”) is a rapidly moving “legal and political” movement world wide which is geared to severely limiting our health freedoms. (It is driven primarily by world wide Big Pharma people – driven now by the US pharma). It is all under the guise of creating world wide standards for our “well being” affecting anything we consume – food and all nutrients, supplements, etc. This has been an extremely insidious and clever low key campaign which is why few people are aware of Codex and its impact. Pieces of this program have been cleverly inserted as “tack ons” in other important legislation that has nothing to do with Codex. All nutrients (vitamins and minerals) are to be considered toxins/poisons and are to be removed from all food because Codex prohibits the use of nutrients to "prevent, treat or cure any condition or disease. All nutrients (e.g., CoQ10, Vitamins A, B, C, D, Zinc and Magnesium) that have any positive health impact on the body will be deemed illegal under Codex and are to be reduced to amounts negligible to humans' health. You will only be able to get these with a doctor’s prescription – and that will be subject to rigid guidelines. There is a saying- one third of what you eats feeds you; two thirds of what you eat feeds your doctor! 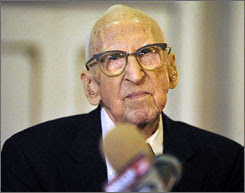 Walter Breuning, who turned 113 on Monday, eats just two meals a day and has done so for the past 35 years. "I think you should push back from the table when you're still hungry," Breuning said. At 5 foot 8, ("I shrunk a little," he admitted) and 125 pounds, Breuning limits himself to a big breakfast and lunch every day and no supper. "I have weighed the same for about 35 years," Breuning said. "Well, that's the way it should be." "You get in the habit of not eating at night, and you realize how good you feel. If you could just tell people not to eat so darn much." His practice of skipping supper began when he first moved to Great Falls from Minneapolis in 1978. He lived in the Yellowstone Apartments at the time and would walk downtown to Schell's in the Johnson Hotel on the Albon Club on the second floor for lunch. In 1980, the Albon Club moved to the Rainbow Hotel, and the owners asked Breuning to be manager, which he did for 15 years. "I never started eating supper again," Breuning said. He gets up at 6:15 a.m. and has a big breakfast every day at 7:30 a.m. Usually it's eggs, toast or pancakes. "You can order anything you want, just like a restaurant," he said. "I eat a lot of fruit every day." Montana Gov. Brian Schweitzer sent Breuning a fruit basket after a recent visit. "Boy, I tell you that was good fruit. I ate the whole darn thing," Breuning said. "Peaches, pears, everything, it sure was good." In addition to eating fruit every day, Breuning also takes a baby aspirin. "Just one baby aspirin," he said, "but everybody gets that for their heart. That's the only pill I ever take, no other medicine." And he drinks plenty of water. "I drink water all the time," he said, and just a bit of coffee. "I drink a cup and a half of coffee for breakfast and a cup with lunch." Breuning said he has been healthy all of his life and believes diet has a lot to do with it. "If people could cut back on their normal weight, it wouldn't be quite so bad," he commented. "They just eat too much!" Breuning remembers his family having a cow, pigs, chickens and a big garden when he was growing up, like most people did in those days. "Everybody was poor years ago," he said. "When we were kids, we ate what was on the table. Crusts of bread or whatever it was. You ate what they put on your plate, and that's all you got," Breuning said. Breuning recalls his mother being a good cook, though she died when she was 46 after an operation in Minneapolis. His wife was a good cook, too. They met when they worked in Butte for the railroad. "Everything she made was good," Breuning said. "We used to have lots of card parties, and they would always say what a good cook she was." While diet has contributed to his longevity, Breuning also believes that working hard was good for him. "Work doesn't hurt anybody," he said, mentioning that he had two jobs, one working for the Great Northern Railway until he was 66 and the other as manager/secretary for the local Shriner's Club until he was 99. These days, Breuning keeps busy talking with all of the people who visit the Rainbow Retirement Center interested in meeting the world's oldest man. Though his vision doesn't allow him to read anymore, Breuning keeps his mind active by listening to the radio. "My eyes are gone," he said, "but I listen to the radio. I get all my news on KMON." Breuning started eating out 35 years ago, but said he doesn't anymore. "Once you get used to not eating in restaurants, you don't want to anymore," he said. Besides, he'd rather eat at home, at the Rainbow Retirement Center. Why it is best to eat only during the daylight hours? (usually around 2 to 3 PM). Give up that bad habit of snacking. sleep when your body is not trying to digest food while you rest. In order for this to succeed, you will need to cultivate new habits. including Dr. Dio Lewis from 1850 and Luigi Cornaro from the 1500s. Europe until the 1600s and goes into the history of how meals evolved. your health, how to deal with social situations, and a plan for how to get started. health and sleep benefits! But this book is inspiring me to make it 5 PM and later 4.
this book very inspiring. Great work, Paul! Beware of Irradiated foods! Although we are being told it is necessary to do so to destroy bacteria & viruses- this is not all thats being destroyed! Caution ,other so called raw foods such as almonds and cashews are also suspect of irradiation- know your sources/companies!